Our product range includes a wide range of brass lightning and lightning brass. With the constant support of experienced professionals, we are fulfilling the varied needs of the valued customers by offering optimum quality Brass Lightning. This part is offered with Brass Natural, Nickel Plated, Chrome Plated, Gold Plated or any coating as per customer specification. Manufactured using ultra-modern machines, we offered these parts in different specifications. Apart from this, we are offering these products at very reasonable rates. Owing to the several years of industrial presence and knowledge of this domain, we are indulged in offering to our patrons a broad spectrum of Lightning Brass. 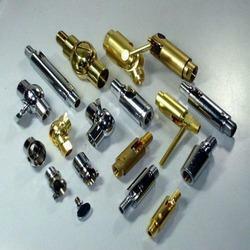 The offered parts are precisely manufactured and coated with nickel plated. The parts that we are offering can also be availed from us in varied specifications as per the demands of our clients. Brass Natural, Nickel Plated, Chrome Plated, Gold Plated or any coating as per customer specification.